July 13 – July 19: 4 Weeks 0 Days – 4 Weeks 6 Days. 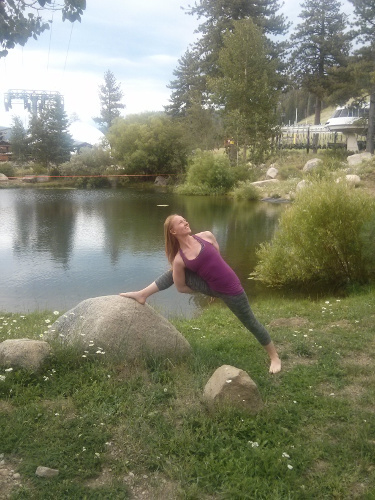 Days before finding out I was pregnant I spent a wonderful weekend doing onderful weekend of outdoor yoga in the mountains at the Wanderlust Festival. Chin pose. We progressed into a deeper backbend—bending the knees and reaching the toes toward the head—before rolling back into upward facing dog. facing dog, rolling along the belly—summary: thud. My practice didn’t feel too different from normal, but I did feel disconnected from my core. 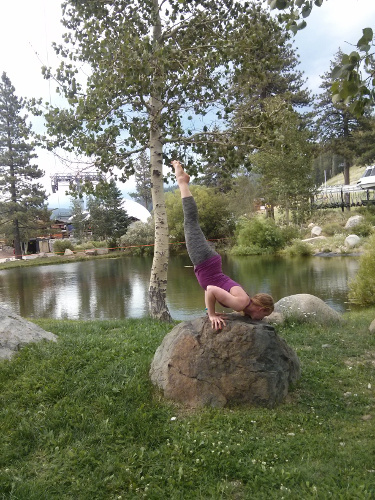 Handstand has never been my forte, and I was even less stable trying to kick up into it than usual. I remember telling the partner that I was working with that my core just didn’t seem to feel like turning on, and had the distinct thought, maybe I’m pregnant. However, a week and a half earlier I’d taken a pregnancy test with a negative result, and besides, Richard and I had just barely started trying. I did a couple amazing guided meditations with Lora McCarville that focused on removing barriers and forming a clear vision for the future. The images that came up for me included me, Richard, three children, and a larger dog than I’d ever want to own. My stance has always been that one kid might be enough—we’ll see how the first one goes and maybe have a second, but that’s it! Who knows what surprises and transformations of opinion the future holds! This entry was posted in Mindful Pregnancy and tagged pregnancy, sugar, vision-casting, visions, wanderlust by Barbie. Bookmark the permalink.